Smithellaneous: Stumbling, Muttering, Wringing. And A Fender Skirt. Stumbling, Muttering, Wringing. And A Fender Skirt. We still aren't sleeping in our house due to a variety of reasons so I am now carting a lot of the stuff that was unpacked into the new house back to the cottage that we're borrowing. It always seems that when I'm at the cottage and need something, it's at the house and when I'm at the house and need something, it's at the cottage. My brain is having to think way too hard just to accomplish the basic stuff of life. My brain is screaming for chocolate. My brain is getting chocolate. Chocolate is the only way to get through each day. Also, to add to our joyous chaos, every sentence Steve and I have said to each other in the past five days has started with, "Honey, have you seen my . . . ?" And every answer has been, "It's in a box." We don't know WHAT box. Just a box. Pick a box, any box. And today, rather than head back to the house to continue to unpack and get one step closer to sleeping there, we are hitting the road in about an hour to drive back to Smithfield (to our other house) in order to take care of some cleaning and repairs there. 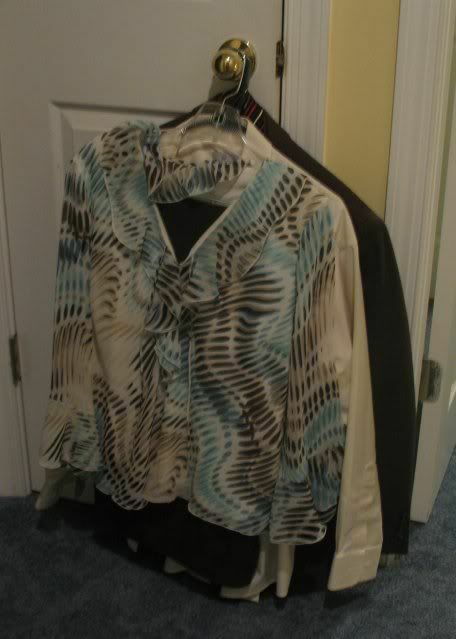 We also have to pack up a few leftovers that we didn't have time to deal with when the Big Moving Guys were there. Have I mentioned I am overwhelmed? And tired of being discombobulated in a most discombobulatory sort of way? My little ol' comfort zone that needs to be well organized has stretched to the point of snapping and I now seem to frequently find myself stumbling around, muttering to myself and wringing my hands. Stumbling. Muttering. Wringing. You should try it sometime. It's tons of fun! It's Bibber's sister who is letting us use her cottage; she lives in Florida and only stays here part of the time. I told Steve that if I didn't have this lovely, cozy, peaceful, well-organized place to come to at night, I would be in serious danger of going utterly insane. And I would also be in serious danger of stumbling, muttering and wringing. At any rate, I won't keep you here too long with my random ramblings and ruminations. I just wanted to let you know how much I've appreciated all your sweet messages of encouragement in the comments section; I love checking in several times a day to get a little boost of the sunshine you've been sending our way. I'll close out with a few miscellaneous pictures before getting ready to head down the highway to Smithfield. To clean. And pack. And organize. And stumble. And mutter. And wring. And chocolate-ize my life. 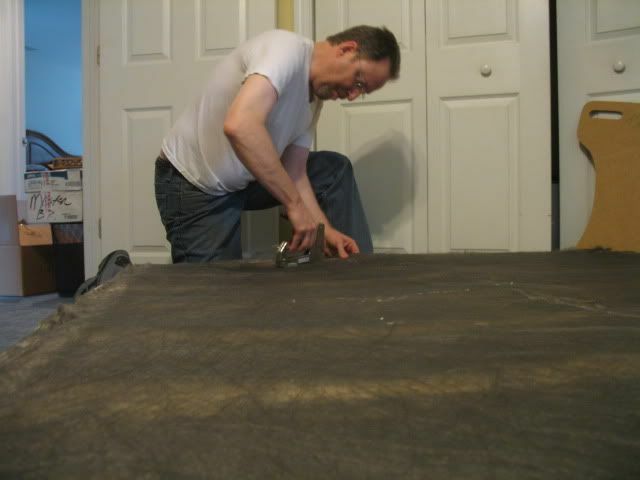 Here is Sir Hubby hard at work repairing the box spring he had to take apart in order to get it moved upstairs. Saturday night found all three of us at the house rummaging through boxes and unpacked hanging clothes to try and find something to wear to church. Have you ever tried to find a pair of earrings and matching necklace in a pile of boxes that rivals Mount Everest? I engaged in a little extra stumbling and muttering but I finally succeeded. Here's Nathan's room in process. We ended up not liking where we'd had the movers put the furniture, so on Saturday, Steve and I ended up moving all the furniture around his room. I told Steve I would be happy to lend him my "massive musculature" for the project. He did very well not to snicker out loud over that particular piece of pitiful hyperbole. 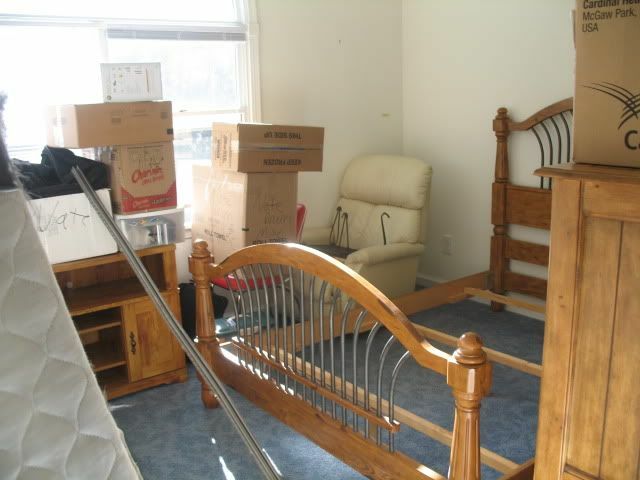 We had just barely managed to get the the mattress shoved into place when Steve suddenly shouted, "Hey, we forgot the fender skirt!" Fender skirt? I stared at him in puzzled bamboozlement before finally realizing that he meant the dust ruffle. Well, suddenly the whole thing just struck my tired brain as being so funny that I almost had to go sit down on the floor because I was laughing so hard. At any rate, we got the giggling over with, removed the mattress, applied the fender skirt, er, dust ruffle, and put the mattress back where it belonged. And then, oh joy of joys, we made the bed. It's the first "made" bed in the new house and I was so happy about it I just had to sit and stare at the bed for about ten minutes. (I don't get out much.) When you're living in the land of chaos, even the small triumphs are huge. One made up bed, complete with a fender skirt; we're making good progress. At this rate, we might even be sleeping in the house before Sarah graduates from High School! Mrs. Pam asked if I knew where a comment was from if she signed under "anonymous." Anonymous asked, "What is on Sarah's Christmas list this year?" Unfortunately, in the middle of this move, Christmas has been pushed far to the back of my muddled mind. At some point, I suppose I shall have to stop stumbling and muttering and start concentrating on the season. And eggnog. And sugar cookies. And chocolate. Jan from Toledo asked which song of mine won the Grand Prize in the national songwriting competition I referred to earlier. Here are the lyrics. We recorded it with a huge sounding orchestra, strings, brass, etc all done on a synthesizer by a guy who does studio work full time and does an amazing job of making orchestral stuff sound "real." We also had some incredible background singers and the song turned out beautifully. The lyrics to that song are beautiful! You're a very talented songwriter. Hang in there, Becky! Just put one foot in front of the other. Breathe! One thing at a time. One box at a time. And of course, there's always your awesome sense of humor and gift of laughter that will see the entire Smith family through your newest challenge. WHAT? You made NATHAN's bed first? He won't be home for another few weeks. Sounds like you are procrastinating....not that I know anything about that! You are so lucky to have the cottage because you don't have to sleep in a house with that nasty cardboard box smell! That is such a nasty, overwhelming smell to me and one I don't forget from move to move. I understand wanting to get organized but don't stress...it will get done. A bit of chaos is good once in awhile. Don't forget to enjoy the Christmas season. The words to that song are perfect! They are so true. What a blessing. Sending lots of love and encouragement and cheer :-)your way! You all are doing such a good job! I got a good chuckle out of "fender skirt". Hee hee. I think God allows moments like those to help ease the stresses in our lives. He's SO good! WOW! 3 houses! Aren't you lucky! And yes, that would overwhelm me, too. I hope you make it through everything. Just take it one peice of chocolate at a time! I had to speak on the Fender Shirt, Dust Ruffle story. Being from Boston and now living in Boise, I have always called it the Bed Skirt. It's funny to hear what things are called in different parts of the country. Whatever the name, I'm glad you put in on Nathan's bed! Now, you need to put your bed together. I bet you can't wait for the night to fall asleep in your very own bed in your very own bedroom in your very own home. I love looking at all of the pictures...what a GREAT home! I would love to see Sarah's room. And what does Snowy think about his new home? ((((HUGS)))) to all the Smith's! I haven't been in the office for a few days and it was such fun to catch up on your progress. You have done an amazing amount of work already and it just takes a long, long time to get each and every box unpacked and placed just right - You may never unpack a few boxes (that has happened to me in a move or two)- somehow when I have gotten around to unpacking those certain boxes, I find I didn't need the contents anymore! Funny, how that happens. I am sure you are anxious to get the new house just right and I can certainly see the need for some painting and carpeting. However, it will come together and you may find having the time to live there before you make any permanent changes will give you a better feel for what will truly make it your own home. You can ponder and settle in and discuss and get to know the house and exactly what will be the best choices. Hope the trip to Smithfield was productive and not too difficult - it probably was a little stressful to return to your old home when it was so empty of all that made it your safe, loving house. I'm AMAZED that you've not missed a beat with your blogging (complete with quality photo visuals!) in the midst of moving, ministry and multiple holidays. Last week's entries could be your most clever and witty yet, in my opinion. Your brilliant mind seems to thrive under pressure. I enjoy your sense of humor and creative-writing skills immensely. Smithellaneous is a daily treat! loved the Fender Skirt story! Several years ago I bought the CUTEST Christmas bedspreads from the Montgomery Ward catalog... and I made my own red "fender skirts"... only with ruffles on one side and the end since the beds are against the wall. I suppose they could be called fender-minis. So now that your mattresses are in new homes, I hope they were flipped according to your master-plan. lol! I love the fender skirt story!! Over here in Australia we call them a 'valance'!!! Becky your words make me laugh so much! We moved last year and I know just what you are talking about! I wish you all the best for a quick and smooth transition into this house and I hope your other house sells soon. Soon you will all be able to sit back and relax and admire the view!